On the occasion of Chinese President Xi Jinping official visit to France, Mr. Liang Wang – Principal oboe of the New York Philharmonic Orchestra- was invited to play with the « Orchestre National de France » at the « Opéra Royal » of Versailles. Concluding the presidential visit of Mr. Xi Jinping and his wife Peng Liyuan -former opera singer-, this evening at the Château de Versailles was an unprecedented event. Late in the afternoon, French President François Hollande and chinese presidential couple visited the famous « galerie des Glaces », before attending this private concert, featuring traditional and contemporary chinese music, as well as famous French excerpts. Mr. Wang performed the piece Extase, by Chen Qigang. 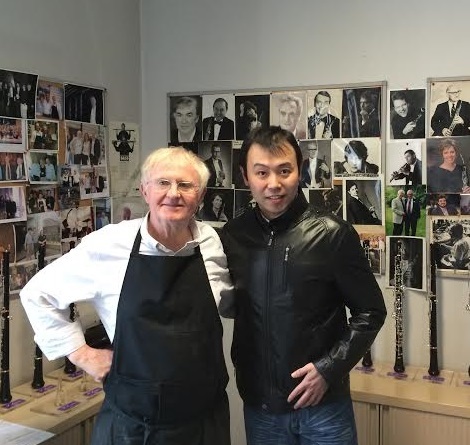 Earlier that day, he gave us the pleasure to come visit us rue de Rome to try new instruments.